Its rapidly approaching my anniversary of my first marathon and I’m feeling really reminiscent. I’m still so early into my marathon journey, with two under my belt and two booked for 2019, so the nerves are still fresh and the learning curve is still steep. I had so many questions, worries and learning experiences during my two training cycles and on race day. A marathon is definitely not as scary as you think. 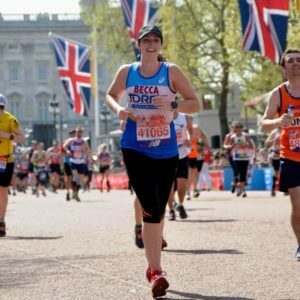 So if you’re embarking on your first marathon this year, or are new to 26.2 here are just a few tips I learned along the way that really work for me! We got this! It’s a marathon not a sprint. Sounds obvious but it really is. When you cross that start line you’re pumped full of nerves and excitement and the temptation to fly off is so great, particularly if you find yourself in with other people who are doing exactly that. But remember, you’re in it for the long haul so pace yourself, don’t go out too quick as you will pay for it later in the race. It doesn’t matter what speed people around you are going, they’re running their race, you’re running yours. Stick to your pace and your game plan. Take a snack to the start line. For my first marathon I didn’t know what to expect and arrived super early. These are most often big and busy events, so giving yourself plenty of time to drop your bag, join the never ending toilet queue and get to your start pen in good time, means an early start and you’ll likely only start running 2 – 3 hours after your breakfast. By the time we reached the start pen in London I was so hangry. The nerves had meant I had been up since 5am, I had eaten breakfast early, but also I hadn’t been able to extensively eat due to the butterflies in my tummy. Luckily a friend bailed me out and shared her pre-race snack with me. I honestly don’t know what I would have done if I hadn’t had Livyy and her pouch of treats! For Dublin I took a Tribe bar to the start and ate this in the toilet queue, I found it really cured any pre race hunger, but also gave me something to distract myself and kill some time. Even if you take something and never eat it, it’s better to be safe than hangry. Test your kit before your race. Even down to your underwear/sports bra/socks. I made this error at London. I religiously tested my shoes, top, running belt and pants but didn’t make note of what sports bra/socks/underwear was most comfortable. On the day I wore a sports bra that I’m not sure if I had worn during my longer mileage training runs and it was freshly washed and I found it really annoyed me from mile 23 onwards. It just felt like it was tickling and pulling my skin round my shoulders and neck. My back was agony the next day and my skin was rashy. It sounds gross but I wouldn’t recommend anything fresh out of the washer as it can sometimes be a bit stiff, either let it sit in a draw for a bit (underwear and socks) or for tops, leggings, sports bras do a short test wear the day before just round the house. Don’t put so much pressure on yourself. If its your first marathon then it’s a PB, if it’s the second, third, fourth, fiftieth its all experience and it should be a good, fun and enjoyable experience. I put too much pressure on myself ahead of London, I peaked too early in my training and I didn’t feel like myself on the day as I was a bag of nerves. As a result I underperformed and spent a great deal of time beating myself up about this. Contrastingly, my second marathon (Dublin) my only goal was to enjoy myself. I ran with a friend, we danced, we sang, we ate lots of haribo and we high fived all the kids, as a result I came away with an almost 15 minute PB off the back of a training cycle that had been littered with injury/illness and I hadn’t run anywhere near as much as I liked. Its important you enjoy the day, don’t overthink it. My attitude now is… I love to run, a marathon is a day where I get to run for 4+ hours with lots of people cheering and people giving me water so I don’t have to carry it, then I get a medal and can eat lots of yummy food after. Its just a day out and a running adventure. Don’t over complicate this. Recovery is key. I was soooo fixated on the training, the carb loading and tapering and the race that first time round I didn’t think much about what happens after (ie the walk to collect your bag which feels like the longest walk of your life!). I’ve now found a recovery strategy that really works for me, everyone is different but some things I find work recovery wise include getting my running shoes off (I swear by oofos), full fat coke, keeping moving, hot bath with a bathbomb/salts, salty fries and compression tights. Practice your eating routine and don’t go mad carb loading! Before London I really got carried away with carb loading and in the days leading up to the marathon felt sluggish, bloated and had constant stomach cramps. Find a level of carb loading that works for you, I find I already eat quite a balanced diet so its just about adjusting that to suit my needs. The night before a big race I always have fresh pasta with tomato sauce and a bit of cheese and a slice of garlic bread, I find this really works for me. Test your night before meal, by having it before one of your long runs and see how you feel. Also aim to eat early evening so that you can digest it all before bed. Testing your morning fuel routine is also essential, as you need to make sure it is the right balance of enough food for energy. I found it really useful to do a test run where I get up early, have the breakfast I intend to eat on the day then go for a long run. You’ll soon know if the breakfast is the right one for you. And if you’re interested, before any big race (10 or greater) I eat a pot of instant porridge (I always have one of the ones you can add water to as it sits better on my stomach than dairy) which I add some golden syrup to, with a slice of toast and Nutella, some water which I sip and a can of coke. Yes I know the coke is terribly unhealthy but I don’t drink coffee so I use it for caffeine and a sweet kick (I don’t opt for diet as I want the sugar). Obviously never take my nutrition advice….. Break it down into chunks. 10k, 10 miles, half, 15 miles, 30km, 20 miles, 35km, one parkrun to go, 24miles, 25 miles, GLORY MILE, extra annoying little .2 even though you’ve probably already hit the marathon distance and you’re now desperately looking for the finish. Give yourself little fist pumps along the way! Run, walk, run when you’re tired and really flagging. Give yourself a chance to recover and get back to it! There is never any shame in walking! Enjoy it! The marathon is the victory parade. You’ve put the training in and its time for glory!